This fast 2.5-inch SSD is warrantied for 10 years and an ocean of writes, but you pay a hefty premium for the peace of mind. So what exactly is a professional SSD, you ask? 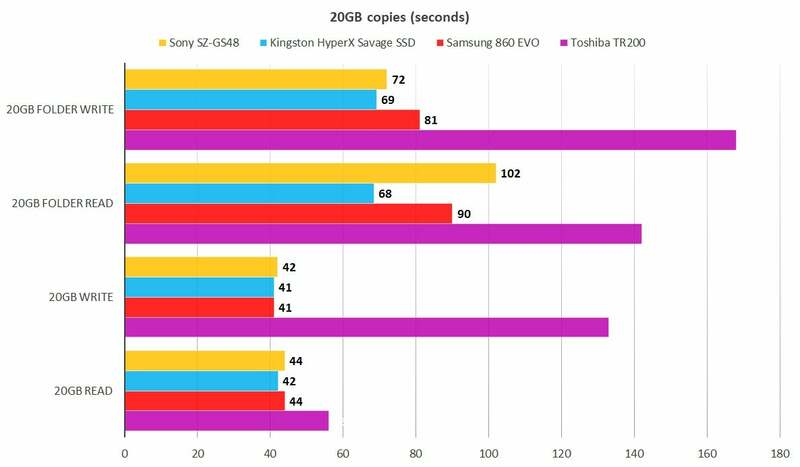 Take a look at the Sony G Series Professional SSD’s outstanding longevity ratings, and you’ll have your answer. Where the average mainstream 480GB SSD is rated for around 180TBW, i.e., the number of terabytes that can be written to it over its lifespan, the Sony is rated for a whopping 1,200TBW. Throw in a twice-the-average 10-year warranty, and yowser! More peace of mind delivered by anything other than Intel’s Optane SSDs. But while the G-Series won’t set you back as much as Intel’s Methuselah-like Optane, they’re more than twice as expensive as the average NAND-based SSD. That begs the secondary question: Do you actually need that kind of endurance? Not likely if you’re an everyday user, but we don’t need sports cars, either. That’s why the super-reliable G-Series makes for interesting reading. Note: This review is part of our roundup of the best SSDs. Go there for details about competing products and how we tested them. We tested the 480GB G Series, the SV-GS48 (available on Amazon). 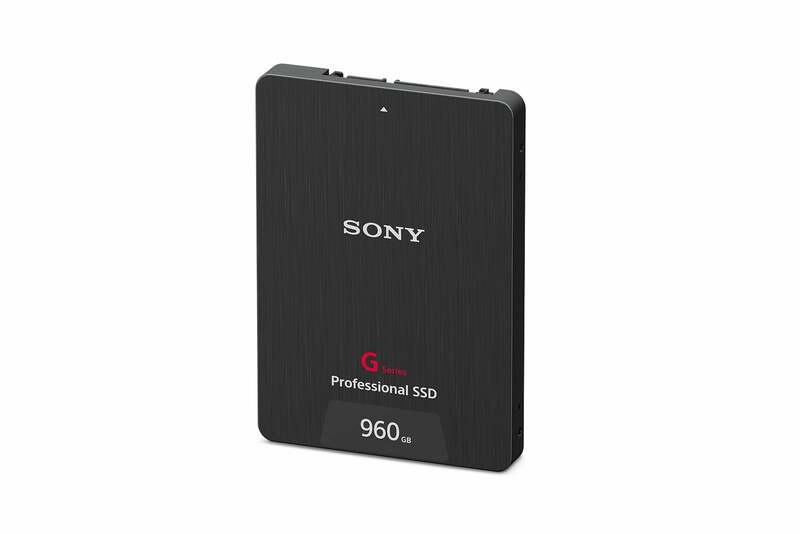 There’s also a 960GB version labeled, yes, the SV-GS96 (also available on Amazon). Both are standard 2.5-inch SATA 6Gbps SSDs, though being 9.5 millimeters thick likely precludes their use in thin-and-light laptops. But end-user laptops and PCs are hardly the market that Sony is aiming to conquer; that would be servers, IT, and data centers. So how does Sony manage to out-guarantee everyone? Well, start with the fact that NAND lifespans have generally exceeded expectations; add a dash of particularly robust over-provisioning (keeping extra NAND on hand to replace worn-out cells), and you’re a long way toward your answer. On the other hand, Sony lays the laurels at the feet of advanced error correction code. That’s some mighty, mighty code if it’s true. But there’s also the fact that you’re paying a lot more for the G Series than you would for their mainstream counterparts. Checking online, we found the SV-GS96 for around $550 and the the SV-GS48 for around $315—roughly twice what you’ll pay for the same capacity in the Samsung 860 EVO (available on Amazon). And, the EVO is hardly the cheapest SSD on the market. Sony can certainly shrug off replacing the drive given the amount of profit garnered at sale time. The 960GB Sony SV-G96 SSD is rated for an incredible 2400TBW. Note that other than confirming that the G Series uses MLC NAND, Sony declined to provide any details about the drive’s internals, such as the controller type or whether there was DRAM cache. Hence, we opened it. The controller is Sony-branded, though the last time we checked, the company doesn’t produce its own. The NAND is 15nm 64Gb Toshiba MLC, and there is a 256MB DRAM chip. Whether the G Series SSDs are good deals for you or not, they are very good performers, albeit better tuned for server use. Also, because they use MLC NAND, there’s no performance drop-off when writing large amounts of data. Said drop-off after running out of cache is the hallmark of TLC drives such as the 860 EVO. Synthetic benchmarks don’t always reveal the phenomenon, and it varies from model to model depending on the size of the cache. The SV-GS48 (gold bars) largely held its own against Samsung 860 EVO, a popular mainstream drive. Note that we do not have CDM results for the Kingston HyperX Savage that’s shown in the other charts. Longer bars are better. CrystalDiskMark 5, shown above, thought highly of the SV-G48 (gold bars), though not quite as highly as it did of the 860 EVO. But as I said, the 860 EVO will lag a bit during long write operations. As you can see below, the SV-GS48 was more than a match for the Kingston HyperX Savage (no longer sold, but the fastest MLC drive we’ve ever tested) with sustained transfers, but fell a bit short in native (non-queued) 4K performance. The Toshiba TR200 is included to show the low end of the spectrum. 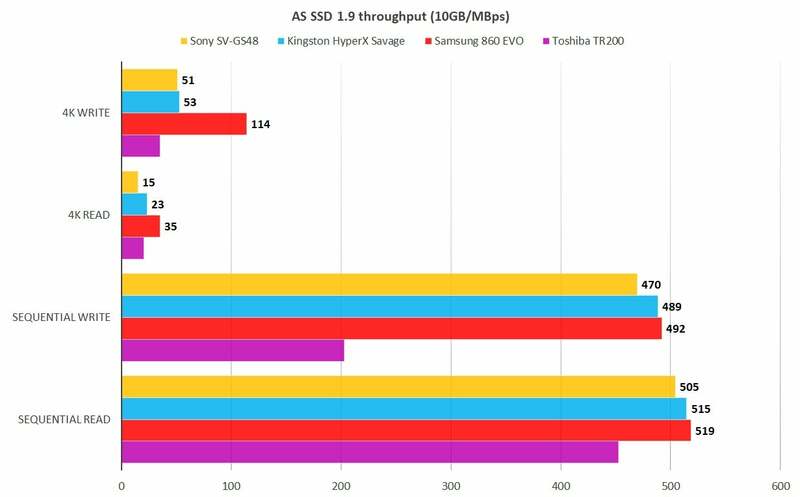 The Sony proved largely on a par with the competition in the 10GB AS SSD 2.0 test. Because AS SSD uses only 10GB of data, the 860 EVO appears better than it actually is during long data writes. Longer bars are better. In our 20GB file tests (shown below), the SV-G48 threw us a bit of a curve ball with its slow performance writing smaller files and folders. Perhaps this has something to do with that advanced error correction code Sony talks about. Or a older controller. The Sony had some issues reading our large set of files and folders, but was otherwise quite fast. Small reads and writes are not it’s forte. Shorter bars are better. When all is said and done, SV-G48 was weakest with non-queued, non-threaded small reads and writes. It was on a par when those files were queued, or when multiple threads were in play, as they would be in a server. There’s absolutely nothing in the NAND-based SATA SSD market that touches the write rating and warranty of the Sony G-Series SSDs. But that peace of mind carries a hefty price tag. Realistically speaking, most PCWorld readers will better off with the far cheaper, and in many cases, equally fast mainstream models. IT and the enterprise, on the other hand, should be intrigued. It’s relaxing not to have to worry about whether you’ve exceeded your warranty or write ratings for and extended period. A very good performer, the 2.5-inch Sony SV-GS46 Professional SSD is also warrantied for 10 years (most others top out at 5 years) and is rated for 2.5TBW (TeraBytes Written) for every 1GB of capacity. Reassuring, but the drive also costs twice or more than the average 2.5-inch SSD.